The Burlingame Treaty of 1868, officially known as the Burlingame-Seward Treaty sought to ease limits on Chinese immigration to America and protect against the discrimination of Chinese sojourners-immigrants in the U.S., and assure that Chinese already in the U.S.would enjoy the same treatment and rights as other immigrant groups in the U.S. The language of the treaty restricted U.S. interference in China. The treaty gave China “most favored nation status” and helped strengthen U.S. trade interests in China. The treaty ultimately benefited U.S. interests over those of China, or Chinese living and working in the United States. The provision of the treaty which protected Chinese in America would ultimately crumble under political pressure caused by mounting anti-Chinese sentiment, propelled by a male, white labor force fearful of the plentiful, hardworking and cheap Chinese labor available to employers. A serious economic downturn in the mid-1870s exacerbated the labor market, and made jobs extremely difficult to obtain. The recession caused an already hostile Caucasian labor market to further organize in number, and solidify their outrage and political power. “America’s foreign policy and relations with China were forced to yield to the domestic policies at home” (Choy 64). In 1880 the treaty was revised. Named after James B. Angell who negotiated the terms, the Angell Treaty allowed the U.S. to “regulate, limit, or suspend” new Chinese immigrants or applications for residency (Choy, 65). According to Paine, Nast and Burlingame admired each other’s efforts and talents. Both shared amity toward the Chinese. Burlingame in particular complimented Nast on his 1868 cartoon featuring the ambassador’s diplomatic efforts. 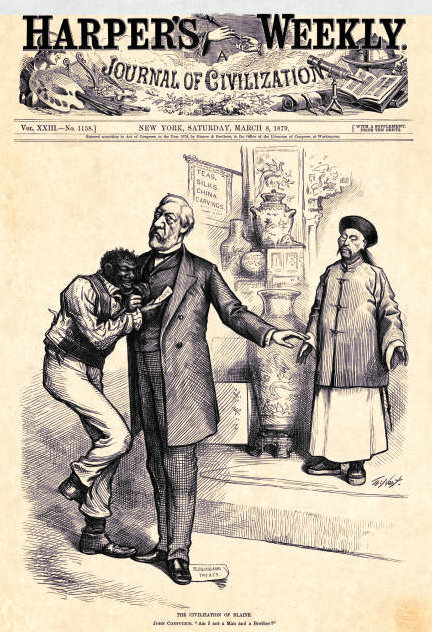 The Burlingame Treaty appears in many Nast cartoons as a prop, usually desecrated by James G. Blaine, a Republican politician who broke with his party’s more liberal positions and regarded the Chinese in America as little better than indentured slaves. With a view of the Chinese as coolie laborers, Blaine put little stock in the validity of the Burlingame Treaty and was an outspoken critic against the Chinese in general (HarpWeek.com). Blaine later campaigned on and voted for the Chinese Exclusion Act. 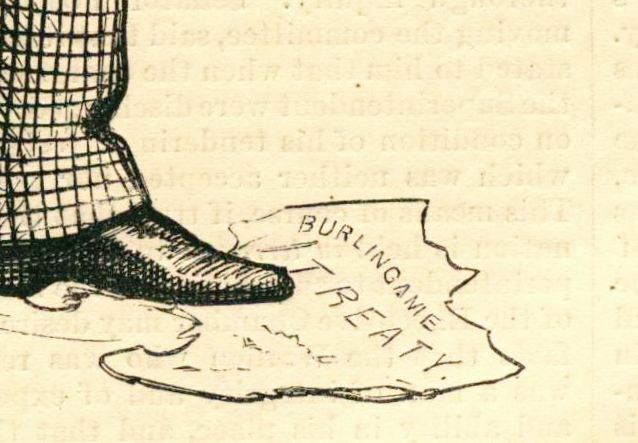 The treaty is typically shown shredded or discarded by Blaine, or trampled underfoot. As a Republican, Nast would not forgive nor tolerate Blaine’s position. Nast attacked him frequently, echoing the veracity of his treatment of William M. “Boss” Tweed, a significance which did not go unnoticed by an ambitions Blaine with his eye on higher office. According to Nast’s biographer Albert Bigelow Paine, Blaine while a U.S. Senator sent letters to Nast’s editor, George W. Curtis and petitioned for Nast to cease producing his caricatures. The requests were not successful, nor were any of Blaine’s three attempts at the presidency. In 1884, Blaine’s nomination as the Republican presidential candidate propelled Nast to endorse Grover Cleveland, the Democrat – the first time in his professional and artistic career Nast would openly endorse a Democrat – a move that many historians believe, began a rapid end to Nast’s career at Harper’s Weekly. This website helped me a lot with my NHD project in school. Wonderful Sidney, glad to hear that, and glad this website helped. What is NHD? This site helped me a lot with my NHD project too. I will, of course, be crediting this site. Thank you Myles! Good luck with your project!